Welcome to the Distilled series where I’ll take some of the most influential and powerful books and concentrate their core ideas down to their most essential points. The first book in this series proved to be quite influential on my life in 2015. For that reason, I’m excited to present The Education of a Value Investor by Guy Spier, Distilled. The following section expands on the ten core elements. When reading, keep in mind that although these core elements are listed as discrete and definable concepts, they are not entirely independent of each other. Each element interacts with the others in the form of a virtuous cycle. Meaning that when you make a positive change in one point, it will positively influence another point, which may then positively influence another point, and so on through the whole system. Additionally, Guy emphasizes the importance of doing things that tilting the playing field in your advantage. Like a casino, you only need to have an imperceptibly small advantage. But given that enough ‘bets’ are places over time, you will come out far ahead. These ten points capture the general process Guy used to tilt the playing field in his advantage. Guy doesn’t embrace ideas with half measures. He has shown that whether it came to both his academic and financial pursuits early in his life, or a Value Investing career later in life, he takes things to the nth degree. “Life can change in a heartbeat.” A goal that seems impossible can become entirely possible if we’re willing to commit every ounce of energy to it. This point was only briefly referenced, but it’s certainly a critical element to both his re-education process and pursuit of an investing career. Guy talks favorably about brainwashing successful habits. Specifically he talks about needing to re-wire himself after his brief career at D.H. Blair. This re-wiring process, by way of brainwashing successful habits, can aid the switch from a life dictated by an external scorecard to one defined by an internal scorecard. Guy calls these positive habit changing techniques a powerful tool in reconfiguring our consciousness. Guy talks extensively about the importance of the Right Environment & Network. Your environment has a massive influence on you, and the importance to set up a positive environment cannot be stressed enough. This includes arranging your work space, choosing the city where you live and work, and the people you associate with. In fact, he left New York to go to Switzerland where his environment would be more insync with his personality, personal limitations, and career. Our environment is much stronger than our intellect. Remarkably few investors-either amateur or professional-truly understand this critical point. Guy says “Nothing, nothing at all, matters as much as bringing the right people into your life.” Specifically, he espouses the benefits of being involved in a Mastermind group. Seemingly all influential people participate in one. Benjamin Franklin had “the Junto”, Warren Buffett has “the Graham Group”, and Guy Spier has “the Latticework Club”. More generally, he writes how critical it is to get into the orbit influential people and other like-minded, motivated, and giving people. It’s really a question of choosing to have certain people in your life (however tangentially) who embody the values you admire… creating the right environment or network helps to tilt the playing field subtly in the right direction so that you can become far more likely to succeed. Advantages are often created imperceptible step by imperceptible step, so it makes a difference to enter the universe of a firm like Ruane Cunniff. Furthermore, he stresses the value being a giver, as well as the need to surround yourself with people who are givers and matchers, while weeding out the “takers”. Tony Robbins calls this process “modeling”. A related process is known as “Matching and Mirroring”. 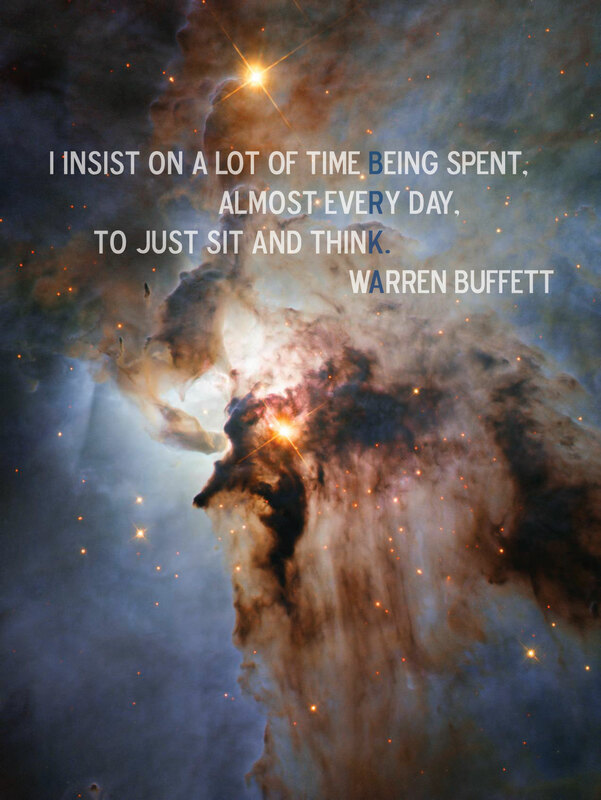 Guy said that sitting down at his desk and actively imagining what Warren Buffett would do if he were him was one of the biggest elements which helped him get unstuck early in his Value Investing journey. 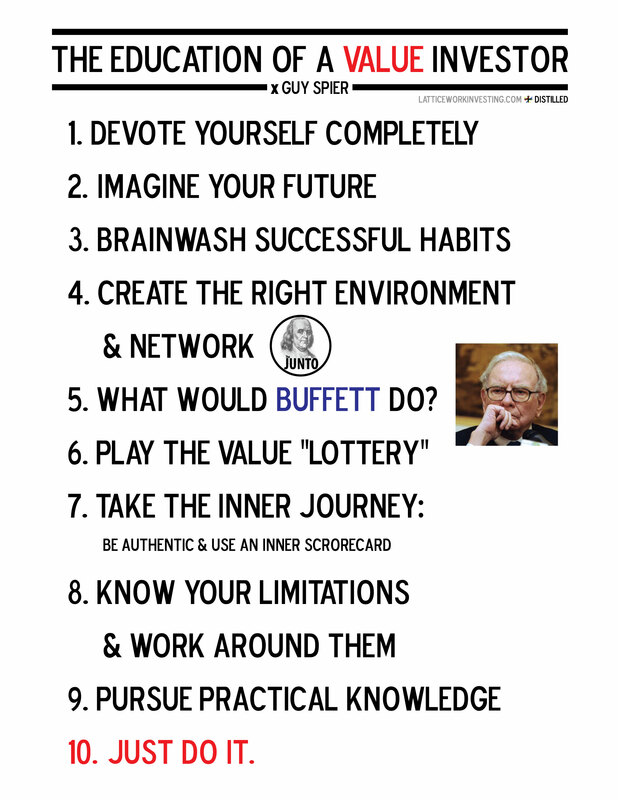 “Desperate to figure out how to lead a life more like his, I began constantly to ask myself one simple question: “What would Warren Buffett do if he were in my shoes?…The minute I started mirroring Buffett, my life changed. It was as if I had turned in to a different frequency. My behavior shifted, and I was no longer stuck. He suggests using matching and mirroring to bring mentors into your life which you may not have immediate access to. You can do this by imagining them in as much detail as possible, even down to how they’d breath, walk, and act. This involves gaining a detailed understanding of them. Doing something with an uncertain but potentially high upside. The payoff may be infrequent, but sometimes they’re huge. And the more often I pick up these lottery tickets, the more likely I am to hit the jackpot. Doing this will subtly tilt the playing field in your advantage. The payoff follows an exponential path. At the beginning, it looks like you are accruing no value, but in the long run, you experience large benefits. He says that you often have to do these things for 5 to 10 years before you start to see the true benefits from them. The value lottery generally involves taking small actions which will benefit you on the margins. By far his favorite way to play the value lottery is through writing thank you notes. Guy started this program over a decade ago where he forced himself to write three thank you notes a day, five days per week. He now estimates that he’s written over 30,000 thank you notes in his life. For more on this topic, you can also listen an interview with The Investor’s Podcast and a talk at Google where he elaborates further. It’s like that Guy focuses on this concept the most. It’s a critical concept if you hope to be a successful investor. He attributes temperament to being the main reason for his investing success. Likewise, Warren Buffett says that investing is 90% temperament, and that if you had an IQ of 160, you can sell 30 of your IQ points because you don’t need them. The goal is to become more self-aware, strip away your facades, and listen to the interior. For an investor, the benefits are immeasurable because this self-knowledge helps us to become stronger internally and to be better equipped to deal with adversity when it inevitably comes. The stock market has an uncanny way of finding us out, of exposing weaknesses as diverse as arrogance, jealousy, fear, anger, self-doubt, greed, dishonesty, and the need for social approval. To achieve sustainable success, we need to confront our vulnerabilities, whatever they may be. Otherwise, we are building our success on a fragile structure that is ultimately liable to fall down. Guy states that it’s not only important to becoming a good investor, it’s reward is something greater. But the real reward of this inner transformation is not just enduring investment success. It’s the gift of becoming the best person we can be. That, surely, is the ultimate prize. The element of knowing your limitations comes from both an understanding of ones self, as well as a general acceptance of the short-comings of the human mind. Only then can an investor structure a process to work around these flaws. “The real challenge, in my view, is that the brain itself-which got us to where we are-is the weakest link. It’s like a little boat, adrift in a sea of irrationality and subject to unexpected storms. Specifically, this involves creating the right environment where you can think rationally and developing an investment process using checklists that can help you avoid making classic (subconscious) mental mistakes. The goal isn’t to be smarter. It’s to construct an environment in which my brain isn’t subjected to quite such an extreme barrage of distractions and disturbing forces that can exacerbate my irrationality. For me, this has been a life-changing idea. Guy learned about many sophisticated economic and financial models during his time at Harvard and Oxford, but he found them to be totally inadequate at explaining how the real world works. Beyond entertaining people at dinner parties, they were essentially useless. Instead, his “Second MBA” focused on pursuing practical knowledge that explained how the world actually works. This concept was likely formed out of Charlie Munger’s concept of a Latticework of Mental models. Charlie states that this kind of education isn’t rewarded in the academic world, but is invaluable when it comes to investing. Guy only briefly talks about this topic, but it was a key element to his success. Continually throughout the book, Guy opted to take action rather than “pontificate in the library”. This is an important lesson for for anyone else who struggles with perfectionistic tendencies and/or procrastination habits. On May 2nd, 2015, I attended my first Berkshire Hathaway Annual Shareholder’s Meeting in Omaha, Nebraska. I happily flew 1,300 miles and committed 4 days of my time and money for this moment. Why would I do this? Simple. 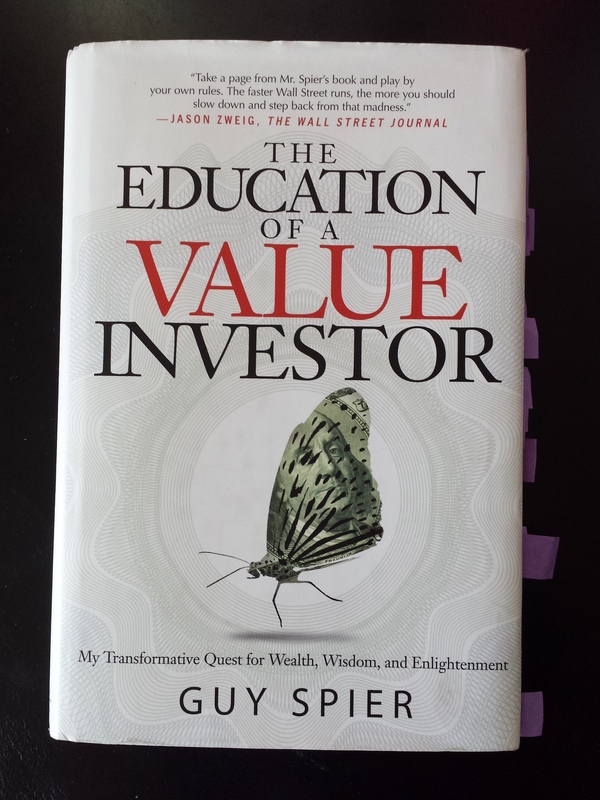 I read The Education of a Value Investor by Guy Spier. My admiration for Warren Buffett stretches back to the mid-nineties, where Berkshire Hathaway’s lofty share price first caught my attention and imagination. And yet, even after two decades of admiration for Buffett, I never foresaw attending the Berkshire Annual Meeting. That changed after I read The Education of a Value Investor. This book caught my imagination, much like BRKA’s share price in the mid 90’s. As a result, I began to change the way I thought and acted. This included my attitude towards attending the Annual Meeting. It was no longer an intriguing idea, but rather a necessity. In this matter, I was not alone. While in Omaha, I attended the Yellow BRKers meeting at the DoubleTree hotel. In his book, Guy affectionately writes about Yellow BRKers and the influence of this endorsement was immediate felt. Alex Bossert, the host of the event, stated that 2015 was Yellow BRKers largest crowd to date. He went on to directly link Guy Spier’s book as the likely cause. Upon talking with Yellow BRKer attendees, I found that there was a general air of reverence surrounding The Education of a Value Investor. He had obviously struck a cord. I even encountered several people who, like myself, after reading Guy’s book, were inspired to attend the Annual Meeting for the first time. It’s not often that you find a book that influences people in this way. Here in Omaha I’d found a group of people that were inspired enough to act on the the advice and insights they’d read. This group of value investing enthusiasts and professionals were the best endorsement a book could receive. This year, I will be returning to Omaha to attend the Berkshire Hathaway Annual Meeting for the second time, and it all started with reading the Education of a Value Investor. How then does a book make such a big influence on so many people? Likely in the same way that both Tony Robbins and Warren Buffett managed to influence Guy Spier so effectively. Honesty. Guy embraced the teachings and values of both of these men because they were honest and authentic. Now, Guy has managed to resonated with his readers by following the same path. Accordingly, the book addresses the importance of taking the “inner journey”. About playing by an inner scorecard and being authentic. But these elements aren’t simply about how to live a better life. Instead, they are essential for anyone wishing to become a successful investor. That’s because you cannot hope to outperform the market if you live your life defined and dictated by external forces. You must first make an internal change, and only then are you prepared to be a successful investor. Guy provides unique insights into the investing genius and life of Warren Buffett. He was able to accomplish this because he approached Warren with great reverence. He paid close attention to even the smallest details and mined Warren’s life for the elements of success which he could then mirror in his own. As a results, reading this book will introduce the reader to insights which most people tend to overlook. Guy’s journey to becoming a value investor was not a linear path. Instead, he spent his youth and early career pursuing prestigious academic degrees, a prestigious wall street job, and the success that goes along with them. His life only started to change after he experienced something of a career existential crisis. Upon finishing his Harvard MBA he began working for D.H. Blair, an investment bank which he later discovered was a morally compromising environment (akin to the infamous Stratton Oakmont). Up until that point, he had been living his life dictated by an “external scorecard”. For that reason, he lamented that he wasn’t able bring himself to leave his compromising employer as soon as he should have. After 18 months, he quite his job and began what he referred to as his “Second MBA” (aka “The Education of a Value Investor”).